When we talk about Concept Cars, the first thing to strike mind is ‘weird designs breaking the notions about future of cars’. 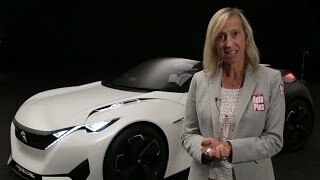 French Automakers having been proving their mark in this since pretty long and they did the same again with their dynamic new unveil, Peugeot Fractal Concept 2015. This remarkable designed electric model from the house of Peugeot offers you an impressive electric range and comfortable ride. 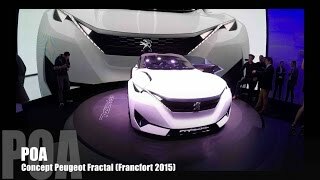 Let us have a look at the review of Peugeot Fractal Concept 2015 to know more about it. The interior of Peugeot Fractal Concept 2015 is highly innovative and futuristic. The i-Cockpit of the concept will amazingly grab your attention. You will notice amalgamation of numerous components in same which includes a massive touchscreen that replaces the traditional pattern of center controls and makes it look futuristic. There is another screen making the instrument cluster while you’ll also have a head-up display for an attentive and safe ride. Going over the company’s words the model has been designed (upto 80%) with 3D printer so as to give the required shape and designs. The dashboard is wrapped in wood with the same pattern being carried over to steering wheel and center console. The touchscreen didn’t only cover the center controls and instrument gauges but also finds a house over the steering wheel and thus makes the concept a lot weird than the practical production models. In all rounding up the interior details of Peugeot Fractal Concept 2015 I would say it’s too bizarre to be believed as a production model. The exterior of Peugeot Fractal Concept 2015 has been designed to have the inner utilities being consumed to best. TO keep the inner audio system undisturbed the exterior has been planned in a way to keep the interior noise-free. The body rolls over taller wheels while the paint scheme is mixture of glossy white and matte black. Both the front and the rear end are adorned with many LEDs in form of turn signal, lights and a charging indicator. There is one very interesting feature at the outside and this is integrated in doors, which can be opened with the help of a watch app. To serve the purpose company has suggested the Samsung Gear S which can also assist you in keeping the command over the air conditioner, other systems and stereo. In all the exterior of Peugeot Fractal Concept 2015 is just like its interior; too futuristic to be digested as production model. Powering the Peugeot Fractal Concept 2015 is a pair 102 hp electric motors mounted on each axle. 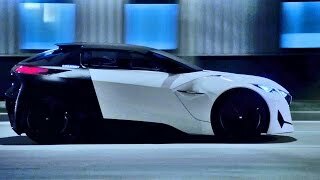 The total output thus produced is 204 hp offering driving range of 280 miles and power enough to sprint the Peugeot Fractal Concept 2015 from 0-62 mph in just 6.8 seconds.